Sliding Wardrobe Door kit price includes white or silver tracks and all required fittings. All 'Standard' doors suit an opening height of 2260mm (with standard tracks, or 2275 if you upgrade to soft close), and are available in 610, 762 or 914mm widths. We include silver tracks with silver doors and white tracks with all others, unless you specify silver in the checkout notes. Click on the doors below to select a design, then click in the opening to build and price your sliding door wardrobe. 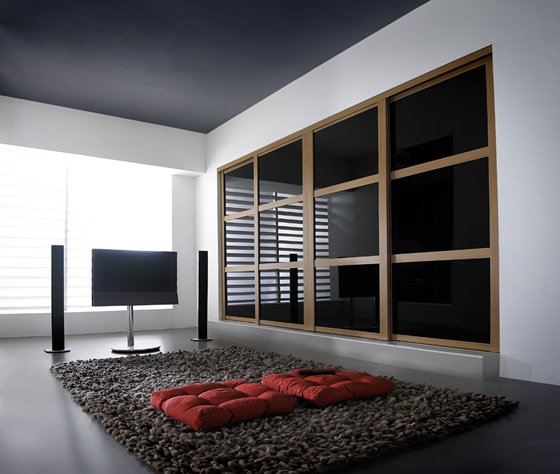 If the sizes or designs don't work for you, then refer to our made to measure sliding door ranges. To build your wardrobe, just CLICK or TOUCH a door above to select it, then CLICK or TOUCH on the wall below to add it. Our Heritage range of sliding wardrobe doors are all simple single panel doors, manufactured in Sheffield to the original patented STANLEY design, with steel tracks and 25cm frames on each door, and anti-jump bottom wheels to the original STANLEY patent. Available in various wood effects, silver and white. 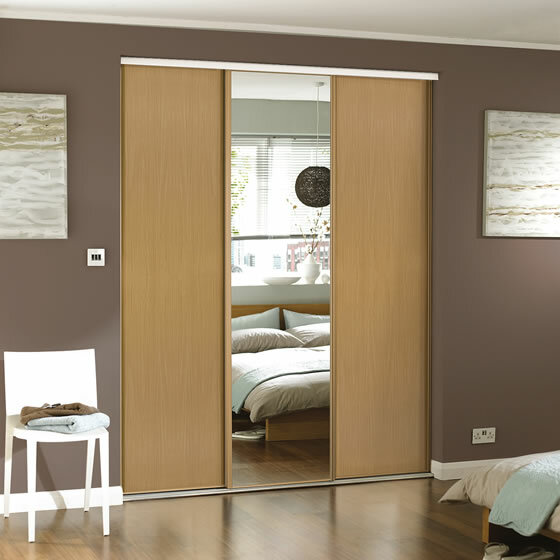 Our Shaker sliding wardrobe doors are available in single or 3 panel designs. The 75mm steel frame makes this a truly unique and robust door manufactured to the original patented STANLEY design. Available in various wood effects and white frames and a brand new range of high gloss coloured glass finishes. Our Classic range of sliding wardrobe doors are now available in 1, 3 and 4 panel options and in our widest range of glass colours (for standard doors). The 35mm wide frame is more substantial than most other standard doors found in most DIY stores. Our Minimalist range of standard doors have a high spec aluminium frame that is mostly concealed around the back of the door to provide minimum obstruction to our stunning glass finishes. The central aluminium bar houses a recessed aluminium handle. Click or touch any door above to select it (other doors will fade). Buttons then appear allowing you to remove the door or move it left or right. Note: Total width refers to the maximum total width without overlaps between front and rear doors. A 25mm overlap is recommended, or increase overlaps to effectively reduce the size of your sliding wardrobe.